Chiropractic coalface 2 brings you more short anecdotes from the clinic. Chiropractic coalface 2 is in response to the overwhelming interest in what actually happens in a DC's clinic, continues the series of weekly answers to your problems. This week it's two patients with severe rib pain. 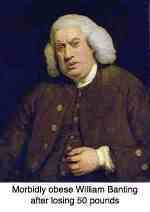 The first, a young woman developed very acute twelfth rib pain, on the left, for no obvious reason. On the right one would be concerned about the possibility of referred gall bladder pain. But ranges of motion, especially deep inhalation and left lateral flexion of the torso caused severe pain pointing to a musculo skeletal complaint. As did palpation over the twelve rib head. From this area there is always the possibility of a referral along the Superior cluneal nerves or Femoral nerve to the groin and front of the thigh, and inner lower leg. The second, a middle aged man, meaning my age, mid sixties! had a more traditional bout of rib joint pain. Again very severe pain after sneezing repeatedly with a bout of hayfever, this time in the midback. Again every breath felt like a rusty knife was being stuck in his midback, the classic sign. No fever, so no concern over pleurisy. Again, chiropractic rib pain treatment worked miracles. There are three joints between the rib and the spine, all capable of causing severe pain. Fortunately, they both came immediately for treatment, so there was no costosternal anatomy referral. Allowed to become chronic, the possibility of a Tietzes syndrome is always a nasty possibility. Update: Two weeks later the young lady with very acute lower rib pain is now painfree, and doing my rehab exercises faithfully. She's happy. The older man was equally happy, until he went to a local restaurant and got rot-gut from chicken livers. He was painfree, but eight hours of vomiting has undone half my work. Actually he's not really complaining. He has 80% less pain than when he first arrived two weeks ago. 50 percent less pain is an important page at Chiropractic Help. Re-injure a joint just as it's healing and you may be in for drama. Fortunately he's not, it's improving again. The older man declares he is 80% better but still gets some discomfort at night. He is currently having a treatment every two weeks. The long and the short of it: beware of getting back into the deep end too soon. If you have a setback it probably will be difficult. Aside: He got rot-gut from the chicken livers because the electrical power in our village is extremely poorly managed, often going off for a protracted period. 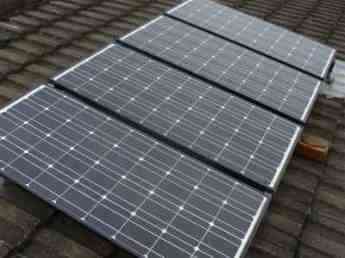 We have two choices: a generator or a solar powered generator ...? We have settled for the latter. CHIROPRACTIC COALFACE 2 : Severe right buttock pain, front of thigh and inner lower leg tingling and numbness. Leg feels like it wants to give. This week a man, fit and strong, who slipped whilst carrying an outboard motor on his boat. He had severe pain in the buttock, tingling in the front of his thigh and the inner side of his lower leg. The L4 dermatome. Examination confirmed a pinched L4 nerve root with worrying hard neurological signs; loss of the knee jerk reflex, weakness of the quadriceps muscle and hyperaesthesia along the course of the L4 nerve root. Medicine thinks Chiropractors shouldn't be treating such cases. But he's has 50 percent less pain after only one treatment. It's going to work out, but he will have to be very careful for six weeks. Update: he has responded remarkably well to balancing of the pelvis and McManus traction. Today I adjusted his spine for the first time. My experience is that if the pain and tingling in feet and legs reduces and goes away, ultimately the strength of the muscle will return (though it may take a few months) and the normal sensation to the leg. The reflex will probably not return, even after surgery. 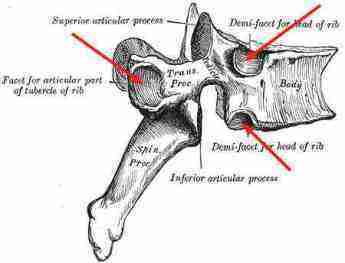 Signs luckily are of a lumbar facet arthropathy and not a slipped disc. This week, a 45 year old man with stubborn coccyx pain. He fell initially onto his coccyx some two years ago. Medical treatment did not help, nor did several external coccyx adjustment by another chiropractor who referred him to me. 90% of the time a coccyx responds to external treatment which is very simple and straight forward. A coccyx pillow helps too. But the other 10% need an internal treatment, rectally. It's not fun for the chiropractor or the patient, not painful, just awkward. The treatment if very short, about two minutes, and in this man's case he reported a 50% improvement after two treatments. Next week he comes for the fourth, after which he will return to his normal chiropractor. If it has to be done, it has to be done. Grit your teeth... or suffer sometimes for years of pain. Update: After the fourth he reported a 90% improvement. I often wonder why we only do an internal coccyx on stubborn cases. Generally it responds much faster than an external coccyx treatment. Tingling in arms and hands is the most read page at chiropractic coalface 2. Always it's difficult, and usually on one side only. If you have symptoms in both arms and good medical examination is in order. A 58-year old patient this week with acute neck pain, shoulder pain and tingling in the hand, mainly the middle finger and palm. Every case is different, and this one too has its quirks. He has all the signs of a seriously pinched nerve in the neck, but the stretch test is negative. He has profound weakness in the fingers... but it's in both hands. His prior history is that he was for three years one of the 50% walking with a serious unknown, undiagnosed disease. Finally, when he had lost 28kg his doctor took his annual check up seriously. Actually it was his wife who made the diagnosis: "Ask your doctor to test you for diabetes." Despite the best treatment, the diabetes attacked his nervous system, and he had to walk for a whole year on crutches. From which he gradually recovered. Now the big question: is that weakness in his hands residual from the diabetes, or from the pinched nerve in the neck? He is certain the former, I'm not so sure... but he's 60-70% better after six treatments, so he is happy and I'm more relaxed. Losing weight for no obvious reason? Take it seriously, and make sure your doctor takes it seriously. It was so encouraging this week to hear from an elderly man that his hip arthritis pain is no longer waking him at night. Walking is still difficult, but that's because of weakness in his legs; medically he is diagnosed as having peripheral neuropathy. So, I have recommended a B complex injection: a thiamine deficiency is now proven to cause demyelination of nerves. Eating a lot of white rice? And another lady. After only three treatments, she can now lift her leg to go upstairs without pain. Night pain is still much the same, but if the mobility has improved so dramatically after only three treatments, I'm confident that the pain will soon also reduce. Fish oil, and our Easier weight loss program are vital. There is no EASY weight loss program, but the honest truth: significantly over weight = diabetes (she is diabetic), hip, knee and foot pain. Honestly, with our weight loss program you really can get it off with only moderate difficulty. 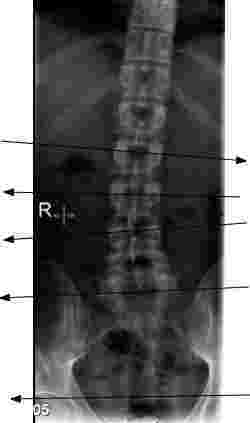 Xrays are an extremely useful and important tool of the chiropractor; there's no getting away from it. But how misleading they can be, if the doctor bases his diagnosis on the radiographs. This week we've had two cases that amply illustrate my point. Mrs S, a 32 year old woman presented with a long history of suboccipital headaches, and severe neck pain starting several weeks previously. There was no radiation to the arm and the Upper Limb Tension Test was negative. However, she did have fairly frequent tingling in the right hand. Her doctor ordered Xrays, which show quite advanced degenerative change at C5 C6 joint for a woman of her age. A good example of the damage that IMMOBILISATION ARTHRITIS after whiplash injury that wasn't well managed can do. Back to my point; the C5 C6 doesn't look good on Xray and I anticipate problems there in the future. But careful examination revealed the pain was coming from C2 not from the arthritic complex at C5-C6. Adjusting C2 was the key in her case. After only two Chiropractic adjustments of C2 she was 80 percent better and it has now resolved completely. Can we help those headaches? Can we prevent the expected arm pain conditions that I predict? Only time will tell. Mr P, a 73-year old man has severe upper lumbar degenerative changes. Bad. Three years ago he had severe back and front of the thigh pain. FEMORAL NERVE AND LEG PAIN He was strongly advised to have surgery but declined and gradually with exercise it resolved. He first consulted me 6 weeks ago with chronic lower back pain, and an ache in the BACK of the thigh. He was taking anti-inflammatory drugs every day. His doctors all said he had severe arthritis in his back and there was nothing to be done. An operation might help. However, careful examination revealed that the pain wasn't eminating from the arthritic complex in the upper lumbar spine, but from L5. After only 6 treatments he is virtually painfree, is not taking any medication, and sleeps through the night. Only sitting remains a problem, and that temporarily. Two days ago he had to go to a meeting involved three hours of driving, and sitting the whole day. Pain. But after doing his exercises that evening (twice a day) the pain resolved. Yesterday and today he has no pain. That is our experience: a combination of exercise and chiropractic is what works. I use the Thompson drop protocol with him. There are no "clicks" when treating him. Mr C is a fantastic offroad biker. Until he fell off four months ago injuring his shoulder. Three months after surgery he was still suffering serious range of motion restriction, pain, disturbed nights and unable to cycle. Whilst there were certainly signs of torn ligaments, pulled muscles, it is gratifying that after only four mobilisations of the AC joint, he declares that it is 80% better. A pinched nerve, without back pain, is one of the conditions where chiropractors don't always win. Mr S is a dam builder, an engineer that involves long trips to strange places. Now retired a 73 he is still working, good for him, but in a low key way. Retirement sentiments - plan to keep working as long as possible. It's the key to a long and stimulating life. Last time Mr S had this condition his doctor said he must lie flat on his back for a month, only going to the toilet. Though the research suggests this is not good practice, it worked for him. Now he's 30% better after three treatments. I wonder if we'll win with him. There are few more challenging conditions at the Chiropractic Coalface than a hot disc with a foot drop. Mr S, a 35 year old man lifted a 50kg pocket of cement. There was sharp stab in his lower back followed my incapacitating lower leg pain. It's not often that patients go so fast to the neurosurgeon, and MRI. The former was having a bad day, fortunately for Mr S, and didn't even test the strength in his lower leg. Mr S was quite unable to raise his heel off the ground. The scan showed a very large prolapsed L5-S1 disc. UPDATE Mr S has also been taking anti-inflammatories, as prescribed by his doctor. They have started to give him SEVERE stomach pain. I recommended he stop, but he continued and, after a particularly rich meal, has a severe attack of vomiting. This increased the pain in the leg, and induced the "cross-sciatic" sign. Raising his left leg produced right leg pain. Despite this set back, after two further treatments he has again improved, and most importantly can now raise his heel off the ground. Strength is returning to the lef. Mr S, a 62 year old builder consulted me two weeks ago with very severe lower back pain, after heavy lifting on site three days previously. The pain was getting worse not better, despite anti inflammatory drugs, and coughing was very painful. He made no mention at first regarding his hip, but later admitted that for some months he was having great difficulty putting on his right shoe. He simply couldn't flex his hip sufficiently to reach his foot. It's always difficult to know when to rush off to the doctor or chiropractor. With pain worsened by coughing, sneezing, laughing, or straining on the toilet it's best not to delay. Happily, after only 5 visits, Mr S is almost painfree, though I have warned him about the 50 percent less pain rule. What is surprising is that his hip - obviously arthritic - has also improved dramatically to some fairly aggressive hip mobilisation. Tha's not always the case, as you'll see from the next case. 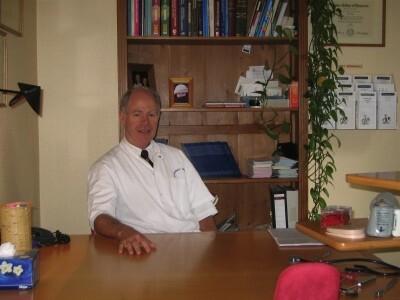 Mr S consulted me four months ago - and had about 10 treatments - for advanced hip arthritis. He felt about 40% better - as long as he continued to come twice a week. Not really a satisfactory solution. I saw him last night at a social function. He had a hip prosthesis fitted 6 weeks ago. It's early days, but he feels that it's been successful and he can walk rather better. Hip surgery, well done, it's an art, can be spectacularly good. But it can also be spectacularly bad, particularly the anaesthetic, or an embolism to the heart or brain. It's only my opinion, but I think it's always trying chiroractic first. Preferably BEFORE it's advanced arthritis. This time Chiropractic was found wanting! Mr S, 38 years old has had episodes of lower back pain for nearly twenty years. After the last six months ago he was left with a disconcerting ache in the back of the right thigh. Three weeks ago he developed a very acute episode of lower back pain after a long air flight, and then lifting his suitcase. Coughing and sneezing, and bending were very painful. The underlying cause of his years long pain is a significant leg length inequality. Because he came quickly, two days later, he has responded well. Range of motion is normal and painfree and the Slump test is negative for a pinched nerve. The pain in his leg has stopped completely. But standing remained problematic - the short leg gives his spine a distinct curvature. Today he reported that after just three days with an insert in his shoe he can stand more comfortably. We are in the rehab phase of treatment, thereafter he will need to come every so often - 6-10 weeks for an occasional adjustment. Interesting discussing orthodontic prodcedures with my very experienced dentists this morning (I was the victim!). He declares that orthodontics is cosmetic only - pretty teeth - and that bringing the lower jaw forward for an over bite is often associated with TMJ syndrome. He wasn't sure how often is often. Often enough to comment. My point: Think twice before sending your child for orthodontics. They may have pretty teeth... but a life time of headaches and facial pain to go with it. Discuss it with your orthodontist at the very least. Today we had two new male patients, and a young athlete reader from Chiropractic Help, all three suffering from breastbone pain, rib pain and associated nausea or indigestion and heartburn. The reason that Tietze's syndrome causes gastric dysfunction is that the diaphragm muscle which the controls the valve beween the oesophagus and the stomach, attaches to the lower 6-7 ribs. Any rib dysfunction can affect the diaphragm with the possibility of gastric and lung distress. 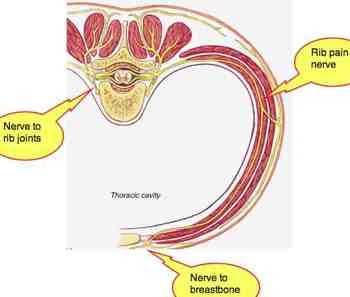 TIETZES SYNDROME ... breastbone pain. Finally! Mr S first consulted me six months ago. Aged 75, he had had pain for fifteen years in the low back. X-rays revealed advanced degerantive changes in the facet joints. He got sufficient relief in the first month to keep coming, realising that he had tried everything else, without success. With the elderly, we try to use less power, less "brute force and ignorance", more kindness, but at his last six-weekly consultation I decided to give him a "goede pak slag" (a good hiding!). All smiles today, he can now get out of bed without pain every morning. Just some stiffness in the neck. Sometimes, brute force without the ignorance, measured and carefully applied, is the only answer. Sometimes. Marinka is only thirteen years old. When her mother first brought her a year ago, she could barely walk, the pain in her groin was so bad. On examination, it was clear that the range of motion of her right hip was grossly INCREASED. Normally not of concern in a child, but when I palpated the capsule of her hip, she screamed with pain. Of great irritation, her doctor refused to order X-rays. Ridiculous for a child to have X-rays! However, I was fairly certain the child had Developmental hip dysplasia (DDH), probably a mild case missed by the paediatrician at birth. Her mother, a woman not to be trifled with, went to a partner in the same firm, who agreed to refer Marinka to a orthopaedist. Indeed DDH. This morning Marinka said she has no pain in the groin, she can walk and even jog a little. What was interesting was that she volunteerd: "If I do my exercises in the morning, I have no pain in the groin. But if I forget... I get the account!" Marinka understands that she can hike and do normal things, but long distance jogging and marathon hiking is not for her. After all, only two-thirds of the hip is in contact with the cup. Interestingly she has been hiccuping a lot lately. I wonder if adjusting the subluxation of C5 will fix it. The Phrenic nerve C3-C4-C5 keeps the diaphragm alive. Why do we hiccup ...? WHY DO WE HICCUP ..? Mr B is 33 years old. He has had low back pain since he was 12 years old, but it's been much worse the last 5 years. 15 years ago he went to a chiropractor and obtained considerable relief, but was forced to stop because his insurance wouldn't pay for Chiropractic. Cezar posture treatment, physiotherapy and a special back school didn't help. All ranges of motion in the mid/ upper lumbar spine were painful. The X-rays told the story: Scheuermanns disease. Scheuermanns is usually in the thoractic spine, and then it's usually not a serious condition. But in the lumbar spine, it's always difficult. It was good see Jan this morning. "Aardig" said he. Pretty good. He's wearing the heel lift for a short leg, but I had to chivvy him a bit again about his exercises. When your teeth stop hurting, do you stop flossing and brushing, I asked. Sheepishly he said no, and we went through the exercises again. And added a more difficult core exercise. He comes once a month for maintenance. so the pity that questions has little healing in its touch." There's no pain like heart-pain. It's been an on-going saga but Granny was broken today when she told me that her daugher's breast cancer has progressed into the ribs and lungs. It all started a year ago when she was 31-years old and 3 months preg. Pity and sympathy have little healing in their touch, perhaps the sqeeze of her hand and shoulder when working on her neck and carpal tunnel. She has to be strong, I told her, she will be the mother to the child... fortunately Granny is responding very well to chiropractic, but it doesn't touch the heart pain, I'm afraid. The Dutch saying is: "Every house has its cross." So true. You be strong too. It's one of the reasons I'm a Christian. Just knowing that Jesus is there, is the best healer of heart pain. He is the bread of life, and feeding on Him every day is what relieves my pain... His touch does have the healing that mine does not. Interesting research in the Netherlands suggests that we have the highest breast cancer rate in the world because of too much animal protein in our diets. May I suggest a change to our authentic hummus recipe? A move to more vegetable protein makes sense... and it takes only four minutes to make. Two weeks ago I was first consulted by a young man with severe leg pain radiating to his right leg. What was ominous was the so-called crossed sign: raising his left leg produced sharp pain in the right leg. Not good. The pain started in his back three months previously, and just got worse and worse under his doctor's regimen of pills. There was slight improvement in the signs (the crossed sign became negative), but no lessening of pain, after four chiropractic treatments and he's been whisked into surgery. Whilst I could give him no guarantee, the bulge seen on MRI was large, I was disappointed that after three months of pain, he was pressured to go under the knife without a solid attempt at chiropractic. CHIROPRACTIC COALFACE 2: ANKLE JOINT PAIN There is a (fortunately fairly small) group of chiropractors who still believe that diagnosis is not important. All we have to do is find subluxations, and correct them. Mr S, a 52 year old man, consulted me two weeks ago with lower back pain radiating down his leg to the foot. The chief complaint was pain in the foot. He had a back operation several years ago that was only partially successful, leaving him with nagging pain in the leg. For the last six months he had quite nasty foot pain. His assumption, and that of his doctor I might say, was that it obviously coming from his back. The neurosurgeon was less convinced but when it became clear that he was facing another back operation, Mr S decided it was time for Chiropractic help. Yes, sir! Whilst it was true that he does have a back problem, and some remaining discomfort in the leg, the Slump test (for me the gold standard for sciatica) was clearly negative. Looking further, it was immediately abundantly clear that the man was suffering from ankle joint pain. The fixation in the cuboid bone in his foot was the spoke in the wheel. It was gratifying to hear him say this morning that the 'pressure' in his foot is at least 40% less, and the nagging pain on the side of his leg was gone. After only four Chiropractic treatments. It's not yet over ... rehab is vital, or the pain will just come back. Lower back and leg pain are the most common complaints at the chiropractic coalface 2. "Don't seek medical treatment if you ... signs or symptoms of nerve damage, such as numbness, tingling or loss of strength in an arm or leg!" This is only an anecdote and carries no weight. But there's heaps of evidence now that if you consult a chiropractor first, you are more likely in the first place not to get those leg pains, and if you do, you'll get over them quicker, more cheaply, and back to work sooner. That's why more and more insurances are including chiropractic, and why chiropractic flourished even when no insurance paid. (PS. I stress medical 'treatment'. Investigation is fine, but having diagnosed a lower back condition, there are heaps of RCTs (the best research), many of them done by medical doctors, that manipulative treatment is then the appropriate referral.) As for the osteoporosis remark from Mayo, that's twaddle too. Just let them come and let them tell that to the elderly ladies I treat on a daily basis, and they'll be run out of town. Like the case after this. Scroll further down. But yes we do have to be careful with ribs, and I confess to my share of cracked ribs. Chiropractic too makes a (small) contribution to iatrogenic illness. But compared to the horrific side effects of anti inflammatory drugs, that's small beer! Mrs P is an elderly lady who fell down a staircase thirty years ago, giving her head a healthy crack against the plinth at the bottom. She consulted me four months ago with a thirty year history of head neck pain. And severe hyaline cartilage damage. It was a tricky case as she has a history of TIAs and stroke. A high risk case for the chiropractic adjustment. I say high risk. That should read highER risk. With osteoporosis and a history of a stroke the MAYO clinic would probably say that both and I and she need our head's read! But, after about ten chiropractic treatments, she's one very happy lady. But yes, I do tread gently ... the truth is that even in highER risk cases, gentle chiropractic treatment is a good deal safer than all the dual antiinflammatory drugs she was taking. And a lot more effective. There is now increasing evidence, though I confess no RCTs, that this kind of hyaline cartilage damage could have been prevented, or at least curtailed if the appropriate mobilising and manipulative and rehab treatment was applied to her neck thirty years ago. In Chiropractic we believe in prevention. Medicine says, "take pills". Your choice. Oh, and of course I have got her off tea and toast, and back to walking every day. 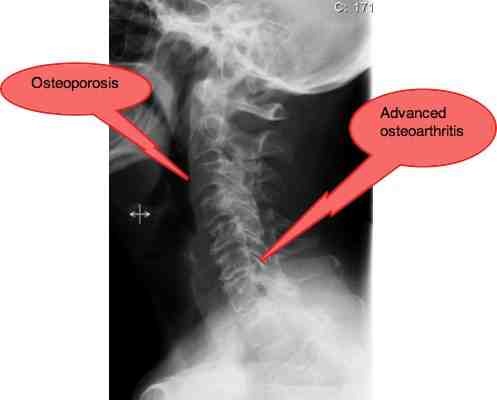 Think causes of osteoporosis long before it arrives. A GOOD DOCTOR - What does it take? Diagnostic skills - until your doctor can figure out WHERE the problem is, the chances of fixing it are minimal. Treatment skills - I may be able to correctly diagnose and find the root of the problem, but I still need the skills to fix it. People skills - Unless I can convey with confidence what the problem is, and how we are going to go about fixing it, good diagnostic and treatment skills are worthless. Yesterday was a thought-provoking day. He had recovered well from the stroke that had affected his left leg. Even the reflexes weren't increased. But a careful examination of his foot, revealed that was really bugging him - pijn in the foot so that he couldn't walk - had nothing to do with his back problem (real though that is too), or his stroke. He was suffering from ankle joint pain. A good doctor? The real challenge lay not in the man's foot, or his back, but convincing him that I can fix the pain in his foot. How good were my "people skills"? We'll have to wait and see ...! Will he be back next week? Why am I telling you all this? Recognise that, from your perspective, what is important is, can your doctor fix your problem. If his bedside manner is weak, he is rude, she is abrupt, they don't present you with a comprehensive plan ... it's silly to stop attending him/her when you know that they can help you. I'd rather attend a doctor strong on diagnostic and treatment skills, than the very plausible doctor with a wonderful bedside manner, but can't fix your problem. It's a compelling thought that 505 of doctors, chiropractors too, graduated in the bottom half of the class! Nuff said! SHORT LEG - another CHIROPRACTIC COALFACE 2 study. A leg length inequality is not uncommon. Usually it's less than 2-3 mm and of no significance, but more than that it is sometimes critical. Mr P, a 25 year old man, is the simplest case of low back pain that I've had to deal with. He's had daily LBP for six months. A heel lift and two adjustments of the pelvis and he has had almost no pain for a month. Whilst a heel lift is no cure-all, sometimes has no profit at all, and occasionally may aggravate the problem, it should always be considered in the case of a scoliosis caused by a short leg. Oh, yes, and a set of back exercises. He's well pleased. Nice to be told you have 'golden hands' but in fact it's not rocket science. LEG LENGTH INEQUALITY ... a cause of back pain. If you follow this website with any consistency you will know there is one area where Chiropractors tread very carefully. It is the patient complaining of dizziness or, as it is known in medical jargon, vertigo. Hence this case from CHIROPRACTIC COALFACE 2. Dizziness is caused by many different problems. Low and high blood pressure. 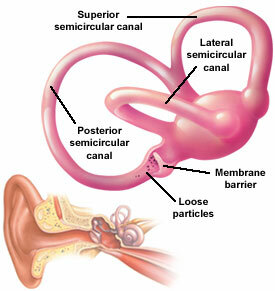 A disturbance in the inner ear called Benign Paroxysmal Positional Vertigo (BPPV). A vertebral subluxation in the neck, just to mention just a few of the more common conditions. And why do Chiropractors tread warily? Because research shows that dizziness is one of the conditions where patients may occasionally react badly to a cervical adjustment. In thirty years I have had just four serious cases, all women aged 40-50. Considering that I give about 1000 cervical manipulations per month, this makes manipulation of the neck statistically a very safe procedure. Nevertheless, all four cases had both themselves and their Chiropractor very anxious! To say the least. All four I'm glad to say recovered completely within a few days, with no lasting adverse affects. Diabetic weight loss - our next CHIROPRACTIC COALFACE 2 anecdote. Remember, these are no more than that. Anecdotes. They will not stand up to scientific investigation. Perhaps there was an eclipse of the sun, and that's what cured them! Seriously, anecdotes are interesting, but should be treated with some sceptism. 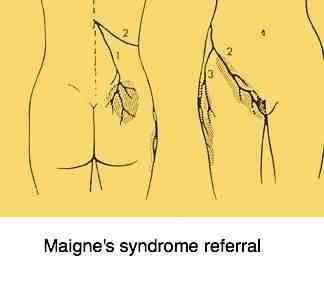 Mr S, a 67 year old obese man, consulted me a year ago with a fairly typical but nasty lumbar facet syndrome. Lumbar facet syndrome ... That holds no particular problems for Chiropractic. He's been fine and comes every 6 weeks under control. It creaks occasionally. What is noteworthy is that under my badgering he's lost 14 kg. And AS A RESULT, THE INTERNIST HAS CUT HIS INSULIN BY A HALF. That's significant for a diabetic osteoporosis. Also, he's much less likely to get hip arthritis and foot pain. She was so excited, itching to tell me. Since starting the Brandt-Daroff exercises eight months ago, which she does faithfully every morning, she has had only one attack of vertigo, compared to SEVEN last year, each of which had her flat on her back for three days. That has other repercussions for a lady of her age. Neck pain and headache and dizziness. I was also consulted at CHIROPRACTIC COALFACE 2 a few weeks ago by one of the women who reacted so badly to a neck adjustment. She was nauseous for three days after the treatment. Although she also has a neck condition, I declined to adjust her neck. Rather, we did the Epleys and I stretched her neck and used my activator, instead of the traditional adjustment. I consider her a high risk case. She was not pleased with me and decided to consult a local Physical Therapist. Low and behold, her husband told me, she had another severe spell of vertigo after his manipulation of her neck. If you suffer from Vertigo, talk frankly to your Chiropractor about the prognosis, risks and alternatives to manipulation of your neck. Stroke ... a short story by chiropractor Bernard Preston.